Rear Admiral Benjamin F. Sands (11 February 1811 – 30 June 1883) was an officer in the United States Navy during the Mexican-American War and the American Civil War. Born in Baltimore, Maryland, Sands was appointed Midshipman in the United States Navy on 1 April 1828. By 1834, he had served on the Brazil Station and in the West Indies and Mediterranean squadrons. From 1834 to 1841, he was engaged in coastal survey work and during the mid-40's was attached to the Bureau of Charts and Instruments at the Naval Observatory. During hostilities between the United States and Mexico, he was attached to the Home Squadron and served off Tabasco and Tuxpan. In the 1850's, he commanded the steamer Walker in the Gulf of Mexico on coast survey duty and invented a deep sea sounding apparatus and other hydrographic instruments. Commissioned Captain in 1862, he served off the west coast on survey duty until 1863, then joined the North Atlantic Blockading Squadron as commander of Dacotah. In February of that year, he participated in the engagement at Fort Caswell. He remained off the Carolinas for another two years, commanding the steamer Fort Jackson during the attacks on Fort Fisher. In February 1865, he was transferred to the West Gulf Blockading Squadron and assigned to duty off the Texas coast. Through the end of the Civil War, he commanded a division off that coast; and, on 2 June 1865, took formal possession of Galveston, Texas for the Union. After the war, Sands, appointed Commodore in July 1866, served at the Boston Navy Yard until returning to Washington, D.C. as Superintendent of the Naval Observatory. Commissioned Rear Admiral on 27 April 1871, he remained at the Observatory until he retired in 1874. 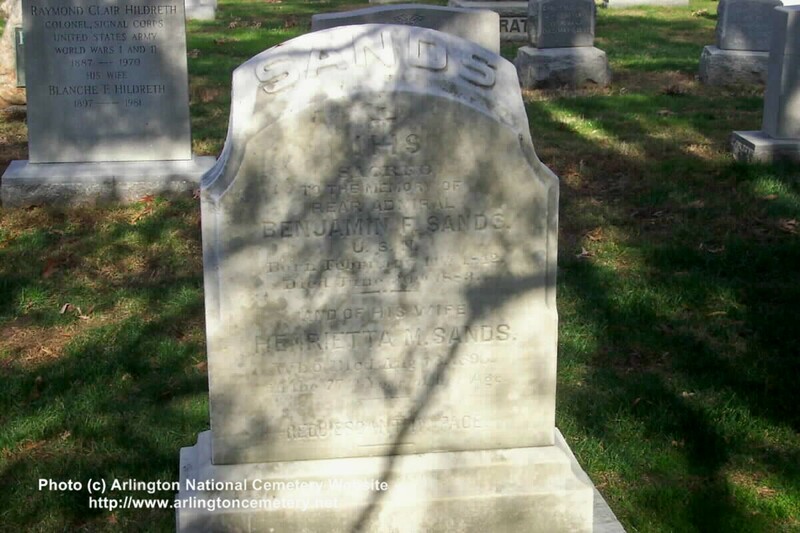 Rear Admiral Sands died in Washington, D.C.
Two ships were named USS Sands for him and his son, James H. Sands. Rear-admiral United States Navy, born at Baltimore, Maryland., 11 February, 1812; died at Washington, D.C., 30 June, 1883. His parents were non-Catholics and he became a convert in 1850, having married a Catholic, Henrietta M. French, sister of Major General William H. French, United States Army. He was appointed a midshipman in the navy from his native state, 1 April, 1828, and passed through the successive grades of promotion until he received the rank of Rear Admiral, 27 April, 1871, and was placed on the retired list on reaching the age of 62 years, 11 February, 1874. During the Civil War he held several important commands with conspicuous success, and in 1867 was made superintendent of the Naval Observatory at Washington. During his incumbency of this office, which lasted until 1874, he advanced the observatory to a place equal to the most celebrated in Europe. For many years he was a member of the Catholic Indian Bureau in Washington. Notes he left were compiled by his son, F. B. Sands, into the book "From Reefer to Rear Admiral". His son George H. Sands, Colonel, United States Army, graduated at West Point and served in the U. S. Army. Three others, William F., F. B., and James H., also served in the United States navy; a daughter, Rosa, became a Visitation nun. His grandson, Alfred Lawrence Pearson Sands, Colonel, United States Army is also buried in Section 1.